Summary: Eight-year-old Sadie Rose is small of stature, but she’s full of strength where it counts – in compassion and in intelligence. When her dear friend, old Mrs. Mindel, suffers a fire at her house, it is Sadie Rose who figures out a solution that cheers Mrs. Mindel and brings the whole community together again. Literary elements at work in the story: The setting of this story, a farming community of Russian Jewish immigrants, probably at the turn of the twentieth century, provides a rich and specific background to the unfolding of the plot. This is a place where both the nuclear family and the extended family of the religious community are central to everything that happens. How does the perspective on gender/race/culture/economics/ability make a difference to the story? Rural farming villages are places where hard work is the order of the day. Kris Wiltse’s computer-generated woodblock-esque illustrations show us farmers milking cows and plowing fields as well as shopkeepers selling groceries, patching clothing, and making boots. What is particularly interesting is that the story also lifts up two residents whom many might never recognize among the productive members of society: an elderly woman with a shaky memory and a sickly eight-year-old girl. Between them, this unlikely pair makes the connections that keep their village life running smoothly. Mrs. Mindel holds the community together at her house in the weekly worship, and Sadie Rose is the quietly attentive genius behind everything from keeping the chicken coop closed to planning for the new synagogue. Theological Conversation Partners: This book brings to mind the story of Samuel’s anointing of David in 1 Samuel 16, when the Lord reminds Samuel that God “does not see as mortals see; they look on the outward appearance, but the Lord looks on the heart.” (v. 7) When shopkeepers and other adults shake their heads at Sadie Rose’s slight frame, Mrs. Mindel reminds them that “there’s all kinds of strong,” and that it is not always a strength that is demonstrated with muscles. This would also be a perfect book to share with children to help them understand the centrality of worship to the community of faith. Singing, praying, telling stories, and reading scripture each Friday night and Saturday in Mrs. Mindel’s small house connect the townspeople not only to the ancient stories of their religious heritage but also to the land that they have left behind for this new American countryside. The children’s eyes are full of joy as they gather in the parlor-turned-shul. When Mrs. Mindel’s house burns, we see Sadie Rose’s papa racing out the front door clutching the village’s most precious possession – the Torah scroll. The loss of this central place of worship is a huge tragedy for the community, and the villagers are confused as they try to make do by changing houses each weekend. Then, at Sadie Rose’s suggestion, the townspeople build a small synagogue to stand where Mrs. Mindel’s house once stood, and the people once again have a center to their worship and to their lives. This story is about a farming village a long time ago. What are some of the kinds of work that people do in this village? 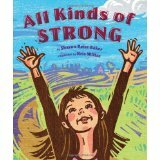 Mrs. Mindel tells people over and over again that there are all kinds of strong. What ways can you think of that would show that a person is strong? Why do you think that the people look happy when they gather on Fridays and Saturdays to celebrate the Sabbath? Why did Sadie Rose’s papa save the Torah scroll when Mrs. Mindel’s house burned? Why do you think that it was important to build the new synagogue? How do you feel when we gather for church on Sundays? All Kinds of Strong by Storypath is licensed under a Creative Commons Attribution-NonCommercial 4.0 International License.